Albion boss Chris Hughton felt his side deserved their 2-1 home win over MK Dons this afternoon but admitted they made hard work of it. Brighton led 2-1 inside 19 minutes through goals from Solly March and Jamie Murphy. Nicky Maynard got a goal back on 23 minutes, before the visitors had a penalty appeal waved away midway through the second period as the Seagulls moved up to second in the Championship. Hughton said: “I thought we were excellent in the first half. I thought we got to the byline and got into really good areas to assist and, at times, I thought Solly and Jamie were unplayable. “Their goal hurts us and it generally changes the dynamics. Unless you get that third goal fairly early, it changes the dynamics of the second half which it did and we certainly made tough work of it. “There’s no doubt we deserved to win the game but I think we made hard work of it. 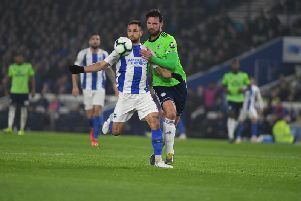 On increasing their unbeaten league run to 17 games, with 16 of the matches this season, Hughton said: “It’s a wonderful achievement for the club, for the players and the staff. You only have to look at this Championship and our games this season to see what a tough ask that is. On March’s stunning early goal, Hughton said: “Solly should get more. He’s a talented young player, drops his shoulder very well, got us into some very good positions today so I’m pleased for him but we all hope that’s an indication more of what’s to come regarding his ability to score goals. MK Dons boss Karl Robinson was furious that his side’s penalty appeal was turned down at 2-1 in the second half when Lewis Dunk challenged Samir Carruthers and said: “That referee’s decision today was terrible. The assistant referee’s decision was terrible. My team selection might have been terrible, our players’ passing might have been terrible but his decision today was terrible. “You have to accept that. I honestly don’t know what he’s seen but for two people to be no more than 20 or 30 yards away, one looking down the barrel, one looking across the park facing it. How can they get it wrong? “Our players can’t do no more. We’ve come up against a very good side. “We huffed and puffed but we just didn’t deserve to lose. We didn’t deserve to win but the referee’s decision today was as bad as I’ve seen.